The following article appears in the 2009–2010 issue of AeroAstro, the annual report/magazine of the MIT Aeronautics and Astronautics Department. © 2010 Massachusetts Institute of Technology. 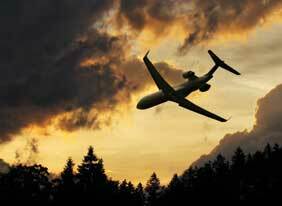 AVIATION AND THE ENVIRONMENT: WHICH WAY FORWARD? One of the defining challenges for the aerospace industry of the 21st century is understanding and reducing air travel's environmental impacts. With air travel demand forecast to triple by mid-century, meeting this challenge will require major advances in aerospace vehicle and information technology, changes to the design of our air transportation system, and the reshaping of our regulatory and policy frameworks. To achieve the right balance of options for mitigating aviation's environmental impacts — be these options technological, operational , or regulatory— we need to both understand the current impacts of aviation on the environment, and have the capability to estimate the effects of possible changes we make as the air transportation system evolves. At MIT AeroAstro, we are addressing both problems. We are working to increase our fundamental understanding of the environmental impacts of aviation, and to develop tools that policy-makers and designers use to assess the environmental and economic implications of aviation policy and engineering decisions. Much of this work is done through the Partnership for AiR Transportation Noise and Emissions Reduction (PARTNER), an FAA-NASA-Transport Canada-funded consortium of nine schools and 50 stakeholder organizations, led by MIT. Aviation is unlike other parts of the transportation sector. The travel chaos in Europe during the April 2010 Eyjafjallajökull eruption was a stark demonstration of aviation's societal and economic importance. No other mode of transportation enables such rapid movement of people and goods across countries and continents. Further, the opportunities for making technological and operational advances are often more limited than for ground-based systems because of the physical requirements for flight (e.g., lightweight, safety-critical systems). Despite the speed of air transportation, the system as a whole has long time constants and considerable technological and organizational inertia. It can take 10 years to bring a new aircraft to market, aircraft stay in service for 25-30 years, and contemplation of major changes to the aviation system must be considered within the context of a safety-centric culture. Take the example of the Boeing 747; it was originally designed in the 1960s, but significantly more advanced versions of the aircraft will likely be in service beyond 2050. Further, aviation is intrinsically international, so effecting change typically requires a lengthy multilateral process. 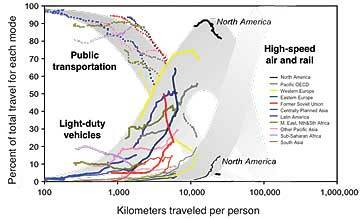 Shift from public transportation to light-duty vehicles to high-speed transportation with increasing travel. Adapted from Schäfer (2006) and Schäfer, Heywood, Jacoby and Waitz (2009). By mid-century, air transportation is forecast to double or triple, with strongest growth in Asia. Indeed, growth in aviation has historically paralleled economic growth. Research tells us that as regions become economically more prosperous, the average miles traveled per person increases. But we also know that the average travel time "budget" per person per day is fixed at about 1.5 hours — this holds in developed countries, and it also holds in developing countries. 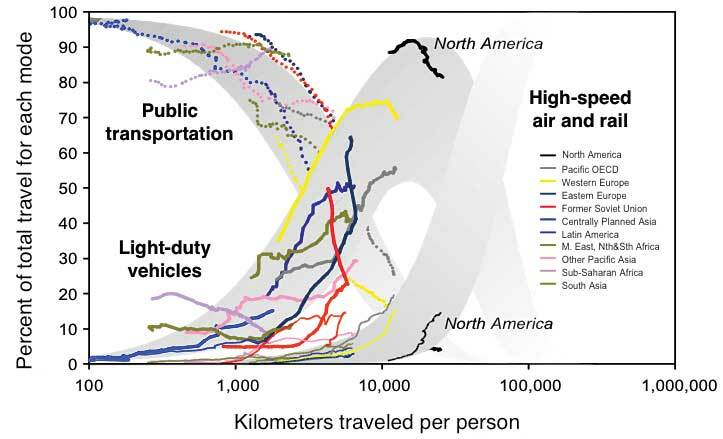 Thus, as societies get richer they gradually transition to faster (and more energy intensive) modes of transportation. Ultimately, this means that given the economic means, billions more people will want to fly for day meetings a thousand miles away, and travel to different continents every year for vacation. Given these trends, it is no surprise that aviation is the fastest growing part of the transportation sector. Finally, aviation pollutes at high altitude where it is the only significant source of anthropogenic pollution. This means that the way in which aviation impacts the environment is different. For example, aircraft contrails form and perturb our climate precisely as a result of where the emissions are deposited in the atmosphere. Much of our research is concerned with understanding how aviation impacts the environment, and how that impact can be reduced. Can an aircraft flying at 35,000 ft cause a risk to the health of people on the ground? This question provides a useful example of the kinds of questions that we address with our research. For as long as aircraft emissions have been regulated, it has been assumed that only landing and takeoff (LTO) emissions — that is, emissions below 3000 ft above the ground — are of concern. But since 90 percent of aircraft fuel burn occurs at cruise, and lacking any rigorous justification of the 3000 ft cutoff, the question required a more careful assessment. This required a combination of aircraft emissions and atmospheric modeling, and making use of epidemiological evidence that enables us to relate pollutant concentrations to health risk. Our findings were surprising. Aircraft emissions above 3000 ft cause perhaps five times more health impacts than emissions below 3000 ft — approximately 8000 or more premature deaths per year versus approximately 2000. To be clear, these are not big numbers compared to the total impacts of poor air quality, which the World Health Organization estimates to be about 1 million premature deaths each year (among many other adverse health impacts). Nonetheless, aviation impacts are significant and may outweigh the safety-related fatalities of the industry by an order of magnitude. Engine manufacturers currently design engines to minimize LTO emissions, which may not be right target. We also found that aviation is the ultimate transboundary pollution source. It is an intercontinental pollution source, but all of our regulations and policies treat it as a local source. Aircraft emit most of their pollution at high altitude in the northern hemisphere, where the prevailing winds are strong and from the west, sometimes reaching 100 km/h. We calculated that while aircraft fuel burn in India and China combined accounts for about 10 percent of the global total, the two countries incur more than one-third of the health impacts of aircraft emissions. In other words, aircraft pollution from North America and Europe adversely impacts air quality in India and China. This is due to the prevailing winds at high altitude, the high population densities in India and China, and certain chemical properties of the atmosphere in that part of the world. There are many uncertainties in analyses such as this. Apart from modeling uncertainties, there are uncertainties in the extent to which particles emitted from aircraft affect human health in the same way as particles emitted from other sources. This is still the subject of study. But despite the uncertainties, decisions have to be made; the world won't wait for perfect science. With this work, as with much of our other work, we are challenged to provide useful advice to decision-makers at the same time we are trying to better understand the underlying science. It is a fact of life that the more we discover about how aviation impacts the environment, the harder policy and engineering decisions become. However, the aim is to help designers and policy makers make better decisions, not to make decision-making easier. Nonetheless, we do try to help in this regard by creating tools to enable policy-makers and engineers to assess the environmental and economic implications of their decisions. This is best illustrated with a contemporary example. The U.S. Federal Aviation Administration recently asked MIT AeroAstro for analyses to inform the U.S. position at the 2010 meeting of the International Civil Aviation Organization Committee on Environmental Protection, the main international aviation policy-setting body. The meeting focused on NOx stringency, that is, the extent to which ICAO member states would introduce regulations to lower the maximum allowable NOx emitted during landing and takeoff operations — a multi-billion dollar regulatory decision for an industry that historically operates in the red much of the time. The panel shows a vertical cut through the atmosphere. The longitude in the northern hemisphere is plotted on the abscissa with the North Pole on the left and the equator on the right. The ordinate of the panel is altitude (plotted as pressure in atmospheric modeling, where surface pressure is about 1000 hPa). An aircraft symbol depicts the location of peak emissions. The light blue lines show average streamlines (wind directions) on a vertical cut through the atmosphere. The polar, Ferrel and Hadley cells can be seen from left-to-right. A significant fraction of aircraft fly in the upper part of the Ferrel cell. Also shown in the panel is the mean zonal wind speed (i.e., wind speed from west to east) in red-white-purple. At typical cruise altitudes, the latitudes of peak aircraft emissions are in a region of strong westerlies, allowing for rapid transport of pollutants to the east. As pollution travels from west to east at high speed, it also descends towards ground level as depicted by the green line. This means that aircraft pollution in North America and Europe impacts surface air quality in Asia. Adapted from Barrett, Britter, and Waitz (2010). Design efforts to reduce engine NOx emissions often result in tradeoffs — typically a small fuel burn penalty and an even smaller noise penalty. The fuel burn penalty leads to increased operating costs and thus increased ticket prices. In deciding whether or not to introduce regulations that further limit aircraft NOx emissions, it is necessary to balance economic factors against climate, air quality and community noise impacts. This is made all the more challenging because of the range of environmental impacts. The CO2 that comes with increased fuel burn has well known climate impacts, but the NOx itself can both warm and cool the climate (depending on a variety of factors) and has a negative impact on surface air quality. While we can, and do, make estimates for all of these costs and environmental effects, there are important — even dominating — aspects of the decision that entail value judgments. For example, to what extent should we value climate impacts of CO2 that may occur hundreds of years in the future, compared to premature mortalities that will occur in the next 10 years? Or, to what extent should we concern ourselves with noise-impacted communities around airports versus the traveling public, who often do not live in regions with high aircraft noise? Such issues require decisions to be made about the distribution of welfare — both in temporal and spatial dimensions. Sometimes our most important advisory role is in disentangling the parts of the decision that can be based on estimates of physical and economic quantities from the parts of the decision that require value judgments. These are only a few examples of our work on quantifying the environmental and economic impacts of aviation, and advising policy-makers. Other areas we are working on that are particularly focused on solutions that mitigate the environmental impacts of aviation include: analyzing the potential benefits of alternative aviation fuels and ultra-low sulfur fuels; assessing the environmental impacts of proposed redesigns of the U.S. air transportation system; and understanding the effects of including air transportation in a U.S. cap-and-trade system. In much of our work we are fortunate to collaborate with colleagues at the U.S. Federal Aviation Administration, other universities in PARTNER, and researchers overseas. Our broad collaborations and direct work with policy-makers will amplify our potential to contribute to developing a sustainable aviation system.